Chinese Koptis of the miraculous but dangerous family of Ranunculaceae . Chinese Koptis is not a perfect adaptogen. It contains alkaloids (berberin, koptisin, palmatin, epiberberin, jatrorhizin, magnoflorin and others) which can cause problems in high doses. However, Koptis can not be overlooked, as it is one of the most important herbs in the Czech Republic and at the same time an example of medicinal plants with antibiotic effects (which are otherwise rare for "real" adaptogens). Koptis is also one of the most important herbs against diabetes . The root is used ( rhizoma coptidis ). Old Chinese literature has been describing the use of this drug 2000 years ago: the root of coptis is considered to be another means of infection , inflammation and " detoxification " (in fact old-school books use the non-scientific concepts of TCM ). Koptis is a part of the antidiabetic herbal mixtures of TČM, of which the most important is the combination with the bayalike ( Liu2013aet , Zhen2011aec ), in which can also be added Rheum officinale and Bupleurum chinense ( Zhen2011aec ). It is well known that Koptis reduces cholesterol toxicity and helps against atherosclerosis (coronary artery) . This also contributes to its efficacy in diabetes, in which arterial hardening occurs in a higher degree. In addition, Chinese koptis are among the effective herb protecting herbs ( Lam2016hec ) and other body cells, such as the brain - according to the Zhang2009btb berberin study of Koptisu, as well as the total extract of Koptis root to protect the hippocampal cells from dying. In addition, according to TČM inspiration, Koptis is used to treat fat metabolism in obesity . Finally, I would like to point out that alkaloid berberin does not occur only in coptis but in dozens of other medicinal plants, for example in poisonous barberry ( Berberis ), after which this alkaloid was named. 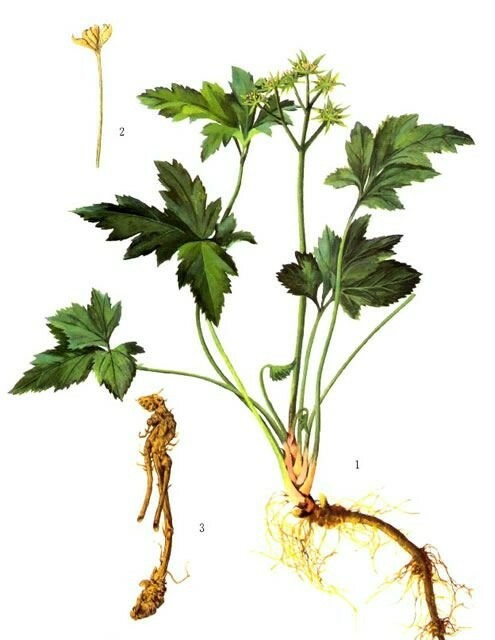 Since Koptis itself is not one of the perfect adaptogens, it should be prescribed by a doctor or other phytotherapist.